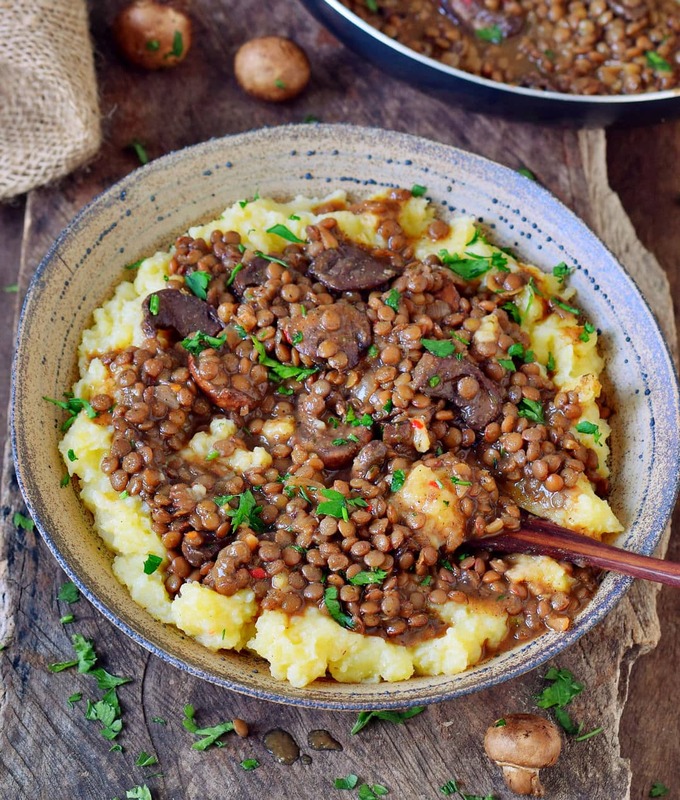 Mashed potatoes and lentils, a perfect match? I love potatoes and mashed potatoes actually remind me of my childhood. My mom used to make them quite often but I don’t remember I ever ate lentils over mashed potatoes. After I saw an Instagram post from Minimalistbaker, one of my favorite bloggers, I fell in love with one of her dishes. She made an easy lentil stew over mashed potatoes and I knew I had to try this combo. And let me tell you, this combo is the bomb! A big thanks to Dana for this lovely recipe inspiration. If you follow me on Instagram you might have noticed that I not only love potatoes but also rice. I post a lot of dishes with rice, for example, my beloved vegan chickpea curry or my creamy vegan mushroom risotto. This easy lentil stew also tastes great in combination with rice. So if you love to vary your dishes, definitely give it a try with rice as well. 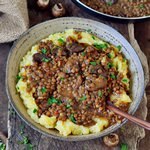 I have made this easy lentil stew already a couple of times with mushrooms but I love to add different veggies as well. My favorite ones are chopped carrots, pumpkin, and zucchini. And never forget to add finely chopped pickles, they make this dish so special (thanks to my mom and dad for the inspo, haha). 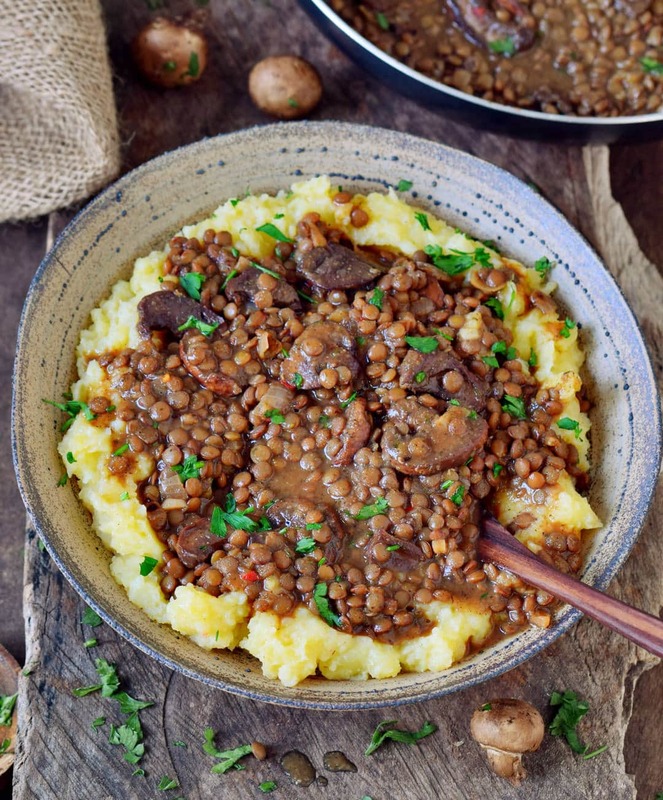 Should you recreate my easy lentil stew, please leave a comment below and don’t forget to tag me in your Instagram or Facebook post with @elavegan and #elavegan because I love to see your recreations. 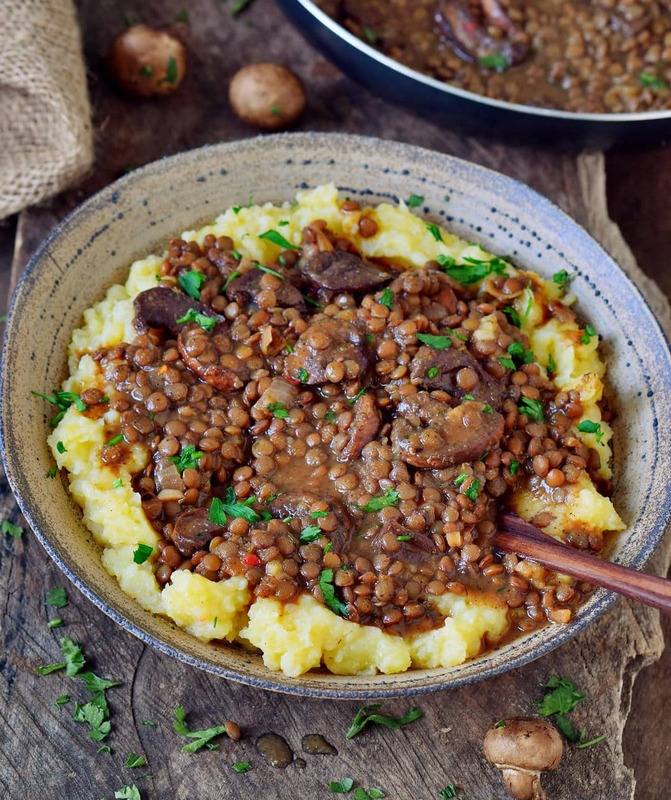 Easy lentil stew with mashed potatoes. This recipe is a great comfort food which is vegan, gluten-free and grain-free. You can add your favorite veggies and enjoy this dish for lunch or dinner. Rinse lentils under running water. I prefer to soak my lentils for about 15 minutes in lukewarm water but this step is optional (discard the water afterwards). Meanwhile, chop the onion, garlic, mushrooms (*see recipe notes). Heat oil in a skillet/frying pan, stir in the diced onion, the minced garlic and fry for 3 minutes over medium heat. Add mushrooms, dried parsley, thyme, oregano, white wine (optional), balsamic vinegar, soy sauce (or tamari/coconut aminos to taste) and fry for a further 3-5 minutes. Now add the lentils and 3 cups of vegetable broth and cook on low-medium heat (add more broth if needed) until the lentils are tender (about 20 minutes). In the meantime, peel and chop potatoes, transfer them to a pot with salted water and bring to a boil. Cook on medium heat for about 15 minutes or until tender, drain. Transfer back to the pot, add coconut milk, nutmeg, black pepper and sea salt to taste and mash with a potato masher (don't use a food processor or blender). Once the lentils are tender, mix a generous splash of coconut milk and cornstarch in a small bowl and pour this mixture into the lentil stew. Cook for a further 1 minute or until the desired thickness is reached. Season again with soy sauce (if needed), black pepper, and chili flakes. Serve warm, garnish with chopped pickles and fresh herbs (optional). I typically use brown lentils which cook in about 20-25 minutes. 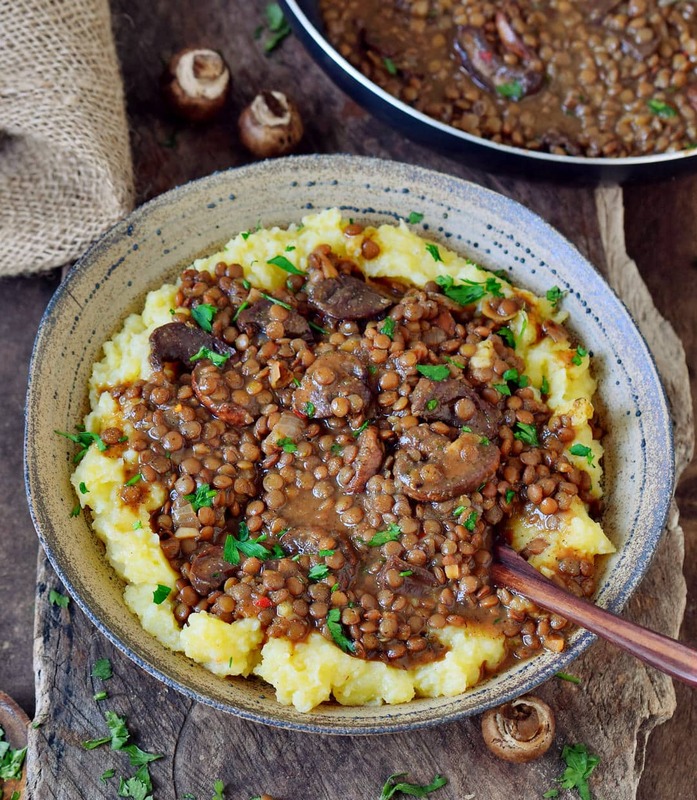 If you don't like mushrooms, you can make this easy lentil stew with chopped carrots or pumpkin instead. You can use any other plant-based milk, however, I would recommend adding at least 1 tbsp of oil if you use e.g. almond milk, oat milk or rice milk since canned coconut milk is higher in fat. Oh I love this recipe. Reminds of you the traditional German dish. Sending love to you. Not sure which recipe you mean. 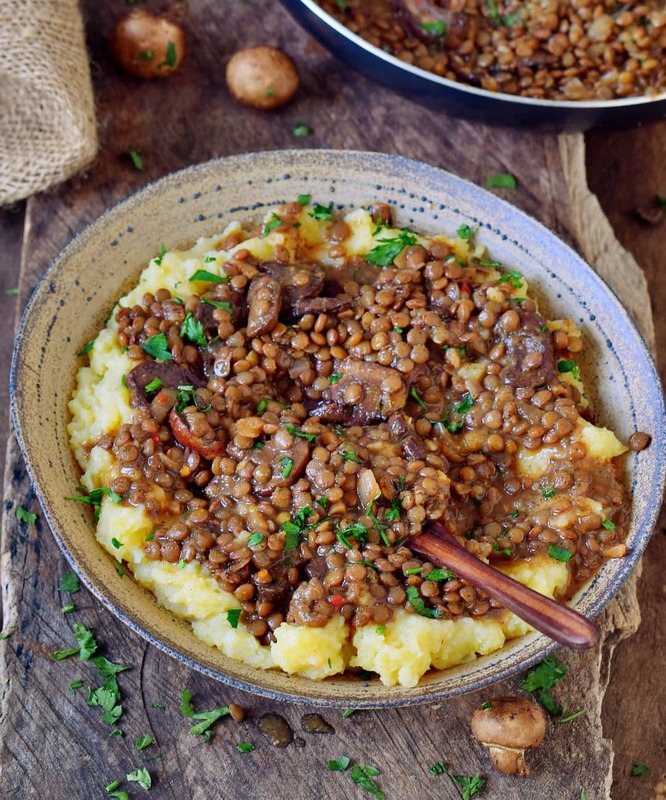 This is an easy lentil stew. If you want to make it with peas, you can simply sub peas for lentils. I made this recipe today( no oil ) my family and I loved it so much thank you so much we really enjoyed it and definitely will make it again ???? Another amazing recipe. You make it easy and delicious to be and stay vegan. Thank you for taking the time to share with us. This lentil stew looks so good to me!???? I love mashed potatoes and lentils! So I think I will definitely try the recipe! This looks so scrumptious Ela ???? I lovvvvve potatoes, and mushrooms! I never would have thought to add pickles! Very interesting ???? Just now making this. What kind of pickles? Pregnant and am making this for dinner tonight! Hope I can do it justice, it’s already making my mouth water. Thanks for sharing it! Delicious! I really enjoyed this meal. Thank you. Thanks so much, Dee. Yes, adding wine adds so much flavor which I love. Just finished stuffing myself with this awesome meal.. Although.i know I’ve had enough, I can’t stop and neither can my partner. Thankfully I almost tripled this recipe so there’s plenty of left overs for tomorrow’s lunch???????????? This recipe looks awesomely delicious!! I will probably have it will Mashed Cauliflower instead of the potatoes to cut down on the carbs, cannot wait to try this soon, thank you for sharing???????????? I’m 5 months pregnant and craving decadent comfort food — so this is the perfect hearty yet healthy and guilt-free fix for me these days! Added zucchini, pumpkin and carrots as well. Delish! The only teensy thing I didn’t like was the nutmeg in the potatoes, but I’ve since made the recipe twice without the nutmeg and now it’s a fave. Hi could this be made in a slow cooker as sometimes i am time restricted? How did it go in the slow cooker? I made this recipe last night, and it was absolutely delicious. I’ts definitely going to be a regular meal in our house from now on. Perfect! Tried it for lunch today and it was so so delicious ! Having the leftovers for dinner with rice 🙂 thanks so much ! This was the the Best lentil dish! Thank you for this amazing recipe! Family and Children approved ???? Would i be able to use the already made lentils they sell in the produce section? Can this be easily altered to incorporate canned lentils? I am so excited to try this. I am going to make it tonight, but I think I am going to make mashed sweet potatoes and regular mashed potatoes, simply because ALL three of my kids do not like mashed potatoes! Hopefully the sweet potatoes will work well! I made this for dinner last night – just added carrots and a couple of tablespoons of tomato paste. It could do with a little more flavour – I’ll try adding more chilli flakes next time. Otherwise, this was a lovely meal – easy to prepare and no leftovers as people went back for seconds. I made these again today, but turned it into mini pot pies. I added shredded vegan cheese to the potatoes and put them on top of the pies. Worked beautifully. This recipe was fantastic. It’s the first I made from this site. I am not a vegan or vegetarian but I have been trying to decrease my consumption of meat and hope to one day become a vegetarian. Thank you for creating such a great recipe to add to my list of vegan recipes. I will be adding this recipe to my rotation of recipes. Also, I am not a big pickle person so I was hesitant about adding them but they worked well in this recipe. Was very good. I added carrots and kale. Did you try to make in the pressure cooker? I want to try in crock pot or Intant Pot. I haven’t tried it in a pressure cooker yet! Should work fine though. Hi. This looks yummy. I am still breastfeeding & my baby is allergic to coconut & wheat. I can figure out what to substitute for the coconut milk, but any suggestions for the soy sauce? And any plant-based milk/cream will be fine. This is a delicious recipe. Love the flavors in the stew. I added a teaspoon of Dijon mustard to the mashed potatoes. Love the nutmeg in the mashed potatoes.. I have a silly question. 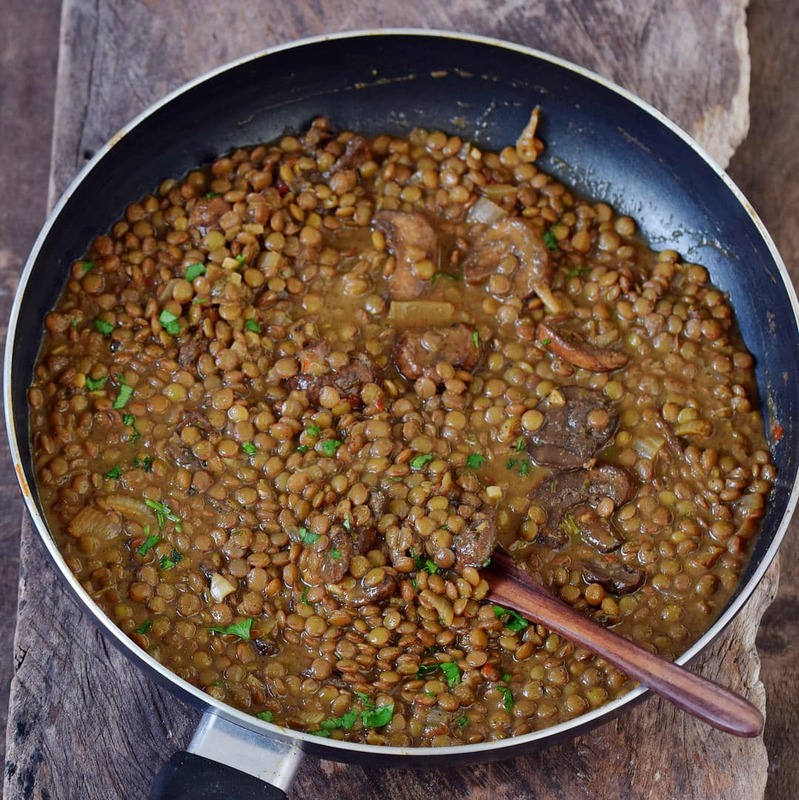 Are brown lentils the same as French lentils? Did not make it vegan, but the recipe is ridiculously GOOD! This has become a go to recipe for me. I use canned lentils when im in a rush and decrease the broth accordingly. Love this!!! Made this twice already, replaced the mushrooms with black beans (husband do not like mushrooms). One of my favorite recipes so far. Sooo good! Thank you! I never tried it but I am pretty sure you could freeze the lentil stew. This recipe looked so good I had to make it. Tastes great! I also added in some leftover carrots and probably a little more wine than you said. My grocery store only had the green lentils and they take a little longer to cook, but it was worth it. I’m definitely freezing some of it since I made the family size pot and there’s only one of me! I have made this recipe a couple of days ago and my boyfriend and I both loved it! And please mind he is not used to eating anything that does not have any kind of meat in it. So, thank you so much for the inspiration! This turned out so good, a keeper for sure. I didn’t really make any substitutions or additions, I don’t think it really needed anything different. Thanks for this. This recipe turned out amazing! I added celery and carrots. I also made it in my crockpot and it came out great! I used sprouted green lentils too and served it over quinoa. Thank you for a fantastic recipe! We had this for supper tonight and it was DELICIOUS! SO GOOD. A woman in my yoga teacher training made this last weekend for our potluck and I literally danced my way into the eating area after taking a bite. I can’t wait to make it myself! Thank you for sharing it.